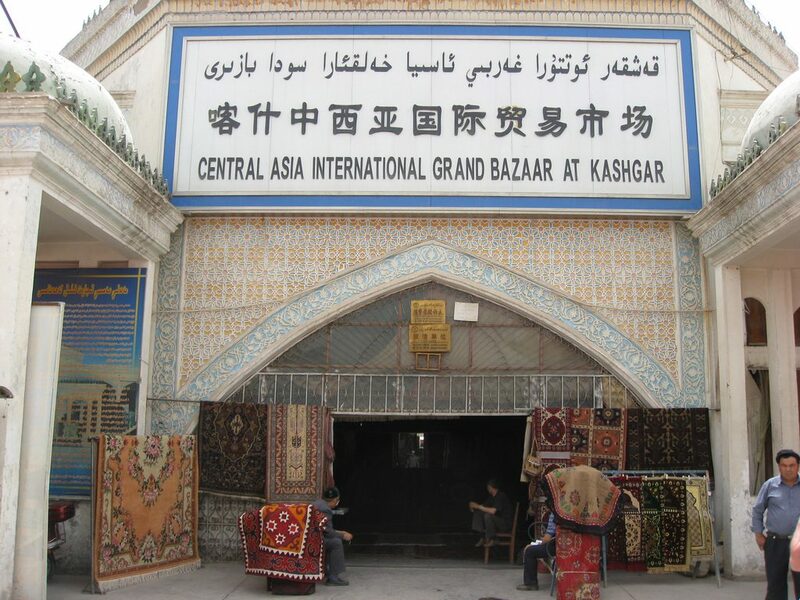 Wander the Sunday Bazaar in Kashgar, an ancient and scenic market with many goods on offer. 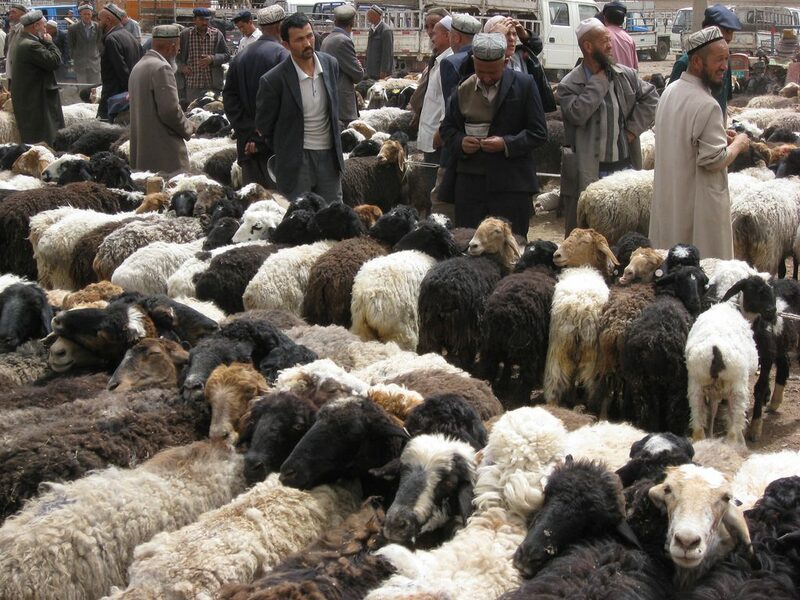 Have a fascinating experience in Livestock Market full of various animals on Sundays. Have a meal at the edge of Lake Karakul — a sparkling glacial lake, then walk around the lake or take a ride by pony or camel to enjoy the scenery. Travel to the Heavenly Lake regarded as “Jewel in the Crown”; and admire the marvelous glacier and snow mountain to the east. Meander through the Erdaoqiao Bazaar, a bustling market with almost everything imaginable. 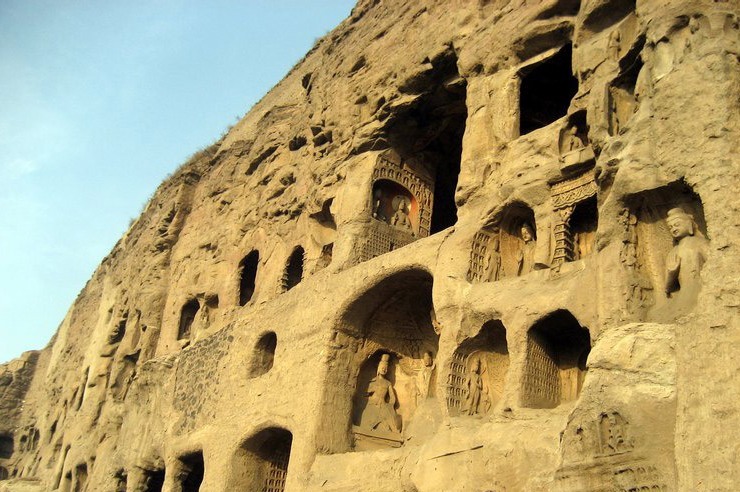 Enjoy fantastic caves and frescos in Bezeklik Thousand Buddha Caves. Take time to visit Suleiman’s Minaret, the only ancient Islamic pagoda in the country. Marvel at Karez Well, famous for its irrigation systems and explore the intriguing history and construction in the nearby museum. 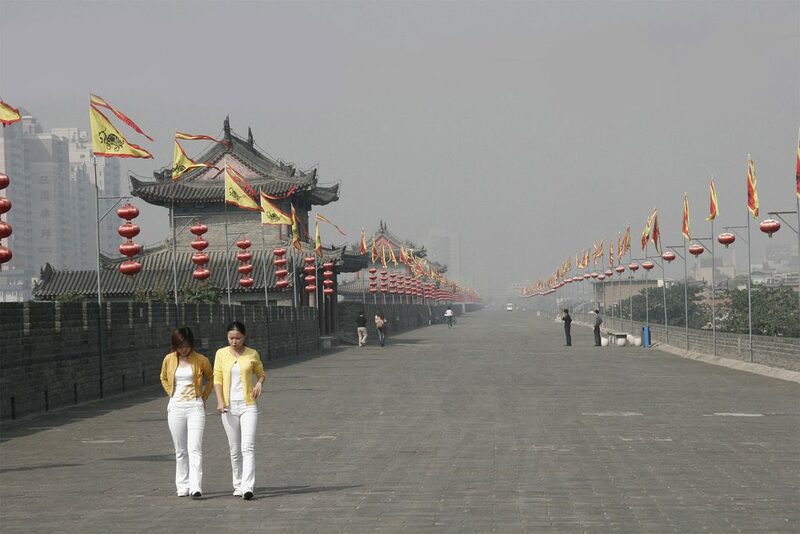 Walk along the Jiaohe Ruin lying between two rivers and imagine it in ancient times. See the mysterious murals and Buddha sculptures with a history dating back thousand years. Appreciate one of the four largest grottoes in China — Longmen Grottoes, which contain amazing cultural relics amid green mountains and blue rivers. White Horse Temple the cradle of Buddhism is also called Home of Sakyamuni; or the Court for Ancestors. 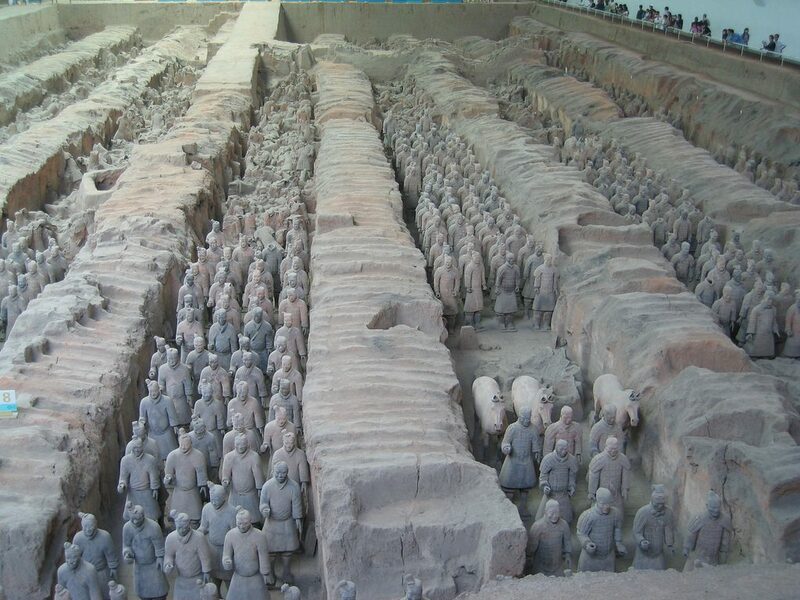 Appreciate the marvelous Terracotta Warriors in full battle array of Emperor Qin’s tomb. 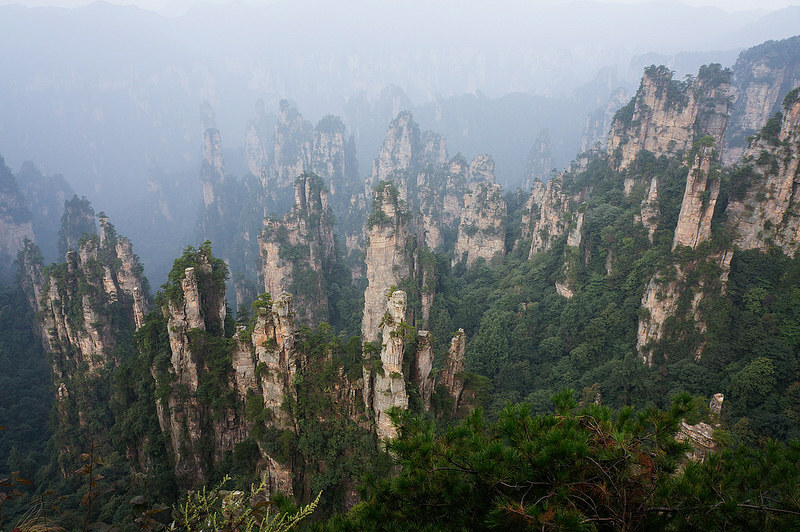 Visit one of the most scenically-beautiful places on earth — the Zhangjiajie National Forest Park. 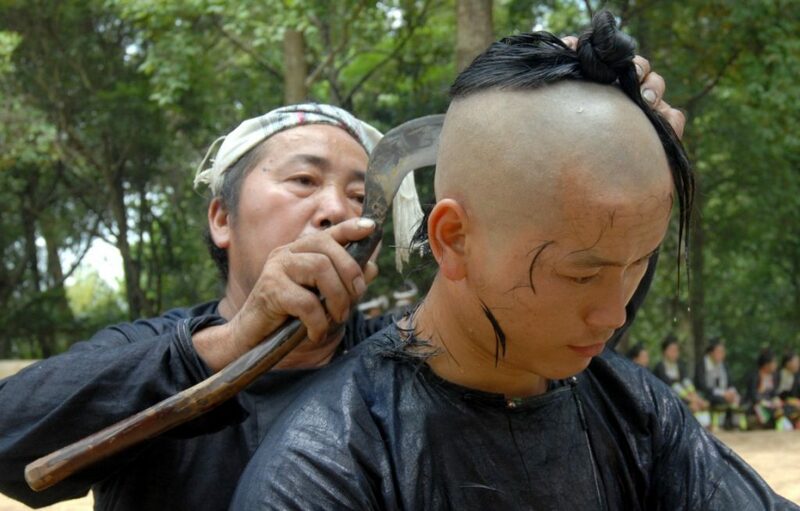 Experience the Dong minority customs and culture at Dong villages like the Tang’an Dong Village. Travel to the Basha Miao Village, a very special old Miao Ethnic village where unique traditions remain. Be greeted by the friendly villagers of Datang short-skirt Miao village and try their wine before entering the village decorated characteristic silver ornaments. Marvel at the spectacular Huangguoshu Waterfall with more than 10 individual above and underground waterfalls, and the water stone forest. Discover the Stone Forest — a fantastic karst landscape and enjoy folk performances and see their colorful embroidery. 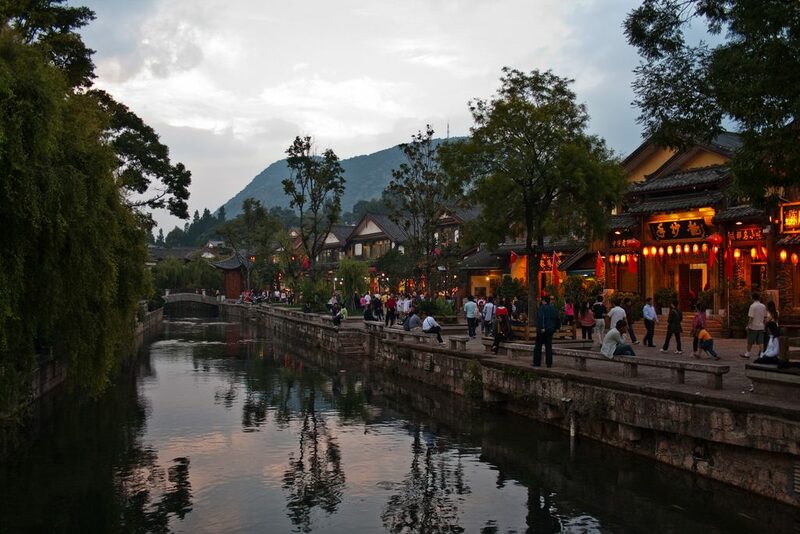 Leisurely wander the streets of Lijiang, a well-preserved old minority city. 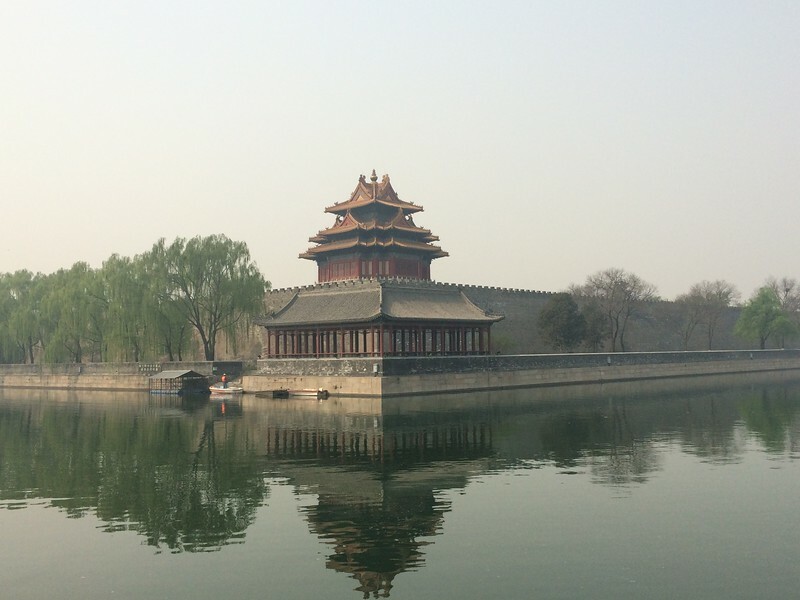 We begin our China tour on arrival into Beijing, where you will be met by your guide and transferred to our hotel. The remainder of your day will be at leisure to relax after your international flight. Overnight at the Dongfang Hotel in Beijing. 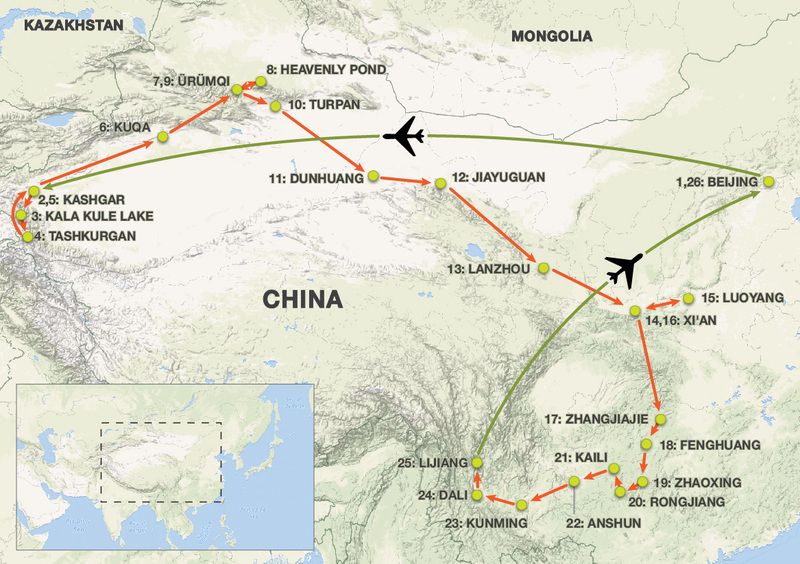 Today on our China tour, we will fly to Kashgar. 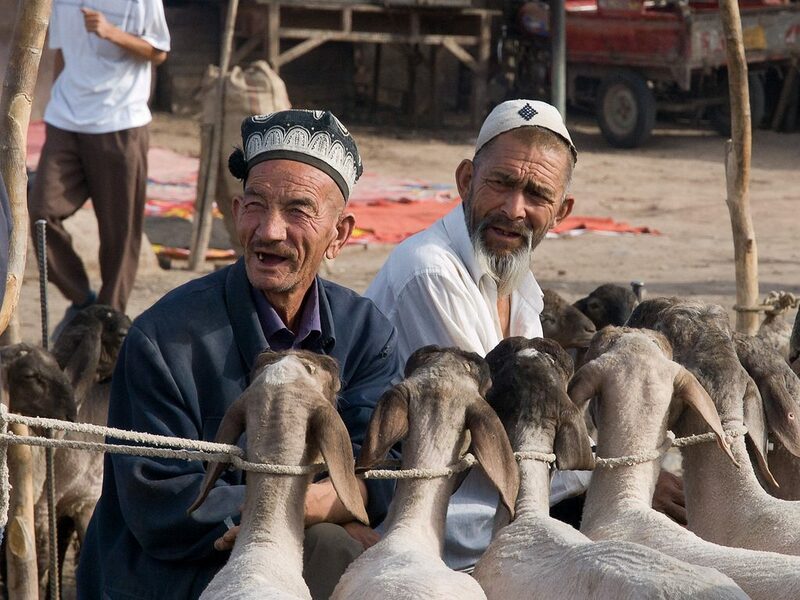 Populated with Uyghurs, Han Chinese, Kyrgyz, Tajiks and Uzbeks, Kashgar boasts the most colorful ethnic diversity of people in the country. We will wander the old town streets viewing the 500-year old remnants of the city wall along narrow lanes and sampling a snapshot of life in this exotic outpost of Western China and provide a sense of what this legendary Central Asian hub was like in the days when the Silk Road was at its zenith. Later we will have dinner and go over our plans for the month ahead. Overnight at Barony Hotel in Kashgar. 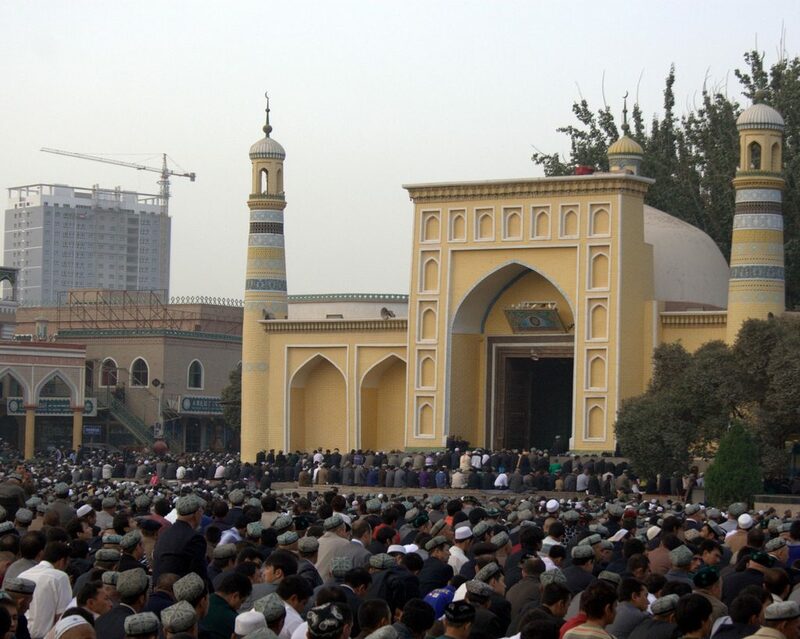 Sunday is the liveliest and most atmospheric day to be in Kashgar, and we will take full advantage of that. 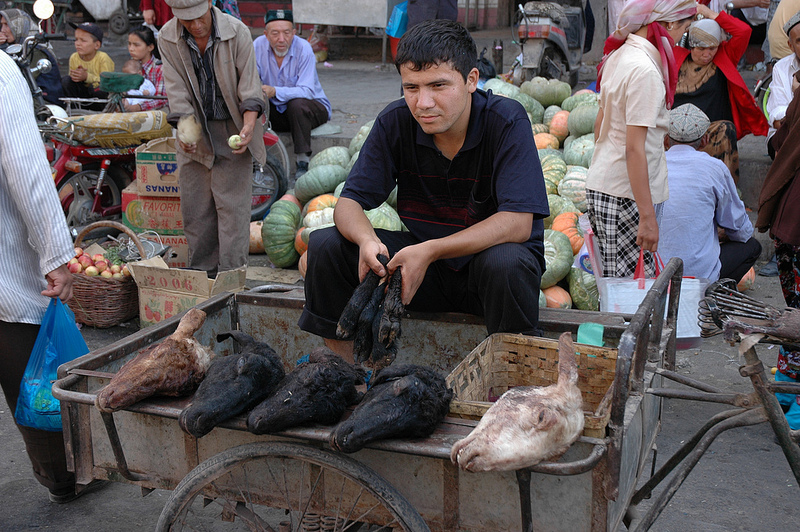 After breakfast we will head to the enthralling Sunday Market, the biggest market in Central Asia where people from all over Central Asia and China come to exchange and buy goods and which dates back over two thousand years. With more than 20 sections spread throughout the market, there is hardly a corner of the market that is not bursting with energy, from average household goods to the livestock areas with donkeys, horses, goat, sheep and cattle — a truly unforgettable experience. Later we will head for lunch and then to the 15th century Id Kah Mosque, which is one of the largest and busiest in China. Continuing on we will reach Zhiren Street, an old street with an amazing range of goods being crafted for sale by hand, from strictly utilitarian cookware to exotic musical instruments. Copper, metal, porcelain, woodwork, jewellery and other goods are seen to be made and you will marvel at incredible devices like the wooden objects that prevent babies from wetting the bed. Finally we will venture through the Grand Bazaar. Famed throughout Asia, this ancient market attracts locals and merchants from all over Xinjiang and nearby countries such as Pakistan and Kyrgyzstan. Overnight at Barony Hotel in Kashgar. 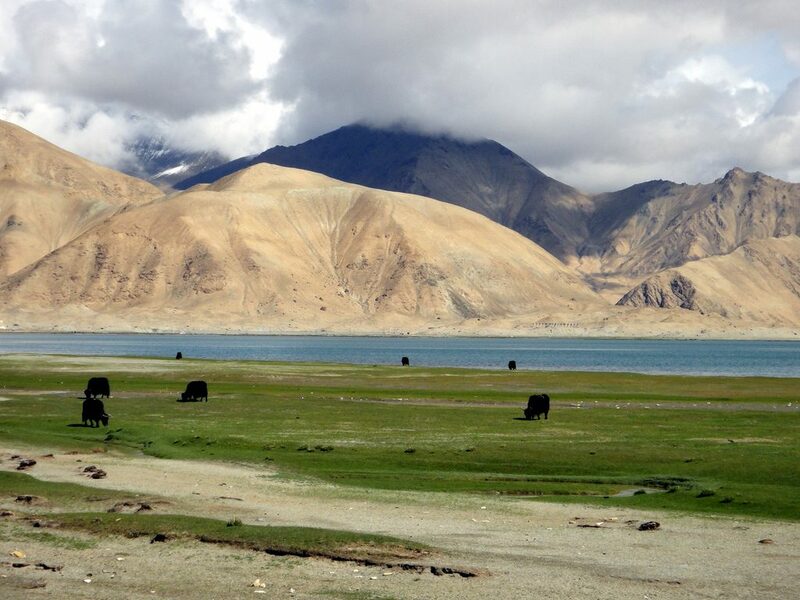 This morning on our China tour, we will drive about 200km west of Kashgar along the famed Karakoram Highway to stunning Lake Karakol (meaning “Black Lake”), which is an icy blue lake located at the foot of the Muztagata Mountains, the second highest of the mountains which form the northern edge of the Tibetan Plateau. Lake Karakol is known for its otherworldly scenery and the clarity of the reflection in the water, whose color ranges from a dark green to azure and light blue. There are two Kyrgyz (Kara-Kyrgyz) settlements along the lake edges and the area is dotted with nearby yurts. For those interested, there will be an opportunity to ride a camel or donkey around the lake to admire the remote and beautiful scenery. 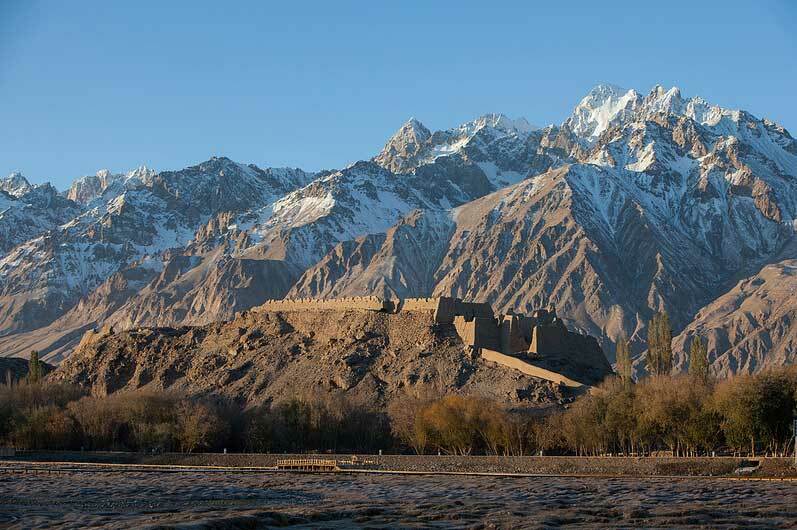 Overnight at the Crown Inn in Tashkurgan. After an early breakfast we will begin our pleasant 6-hour drive back to Kashgar. En route back we will stop off at the City of Rocks, which is also known as Stone City and house the remains of the the capital of the Puli Kingdom, one of the 36 kingdoms in the Western Region under the jurisdiction of the Han Dynasty. 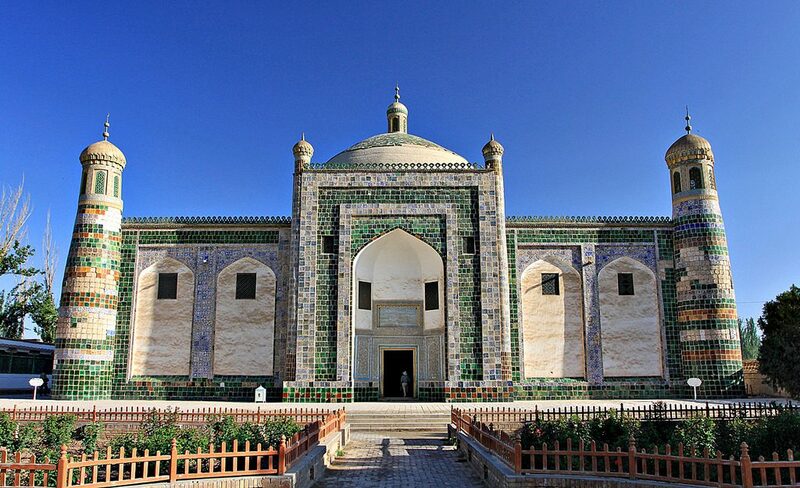 Once back in Kashgar, we will visit the Abakh Hoja Mausoleum, which is arguably the finest example of Islamic architecture in Xinjiang. Overnight at Barony Hotel in Kashgar. A long, 10-hour day of exploration across Western China is ahead today as we drive throughout the countryside of the Taklamakan Desert to Kuqa, which is the birthplace of Qiuci Culture. On arrival we may stroll the town, which is divided between the New Town (Chinese) section to the east and the Old Town (Uighur) to the west. Overnight at the Kuche Hotel in Kuqa. This morning on our China tour, we will venture 65km west of Kuqa and visit the Kizil Caves, which are a set of rock-cut caves believed to be the oldest Buddhist cave complex within the country on the northern bank of the Muzat River. Moving on we will visit the Grand Kuqa Mosque, dating back from the 15th century and housing a praying hall supported by 88 pillars and a fine example of Uygur architecture. 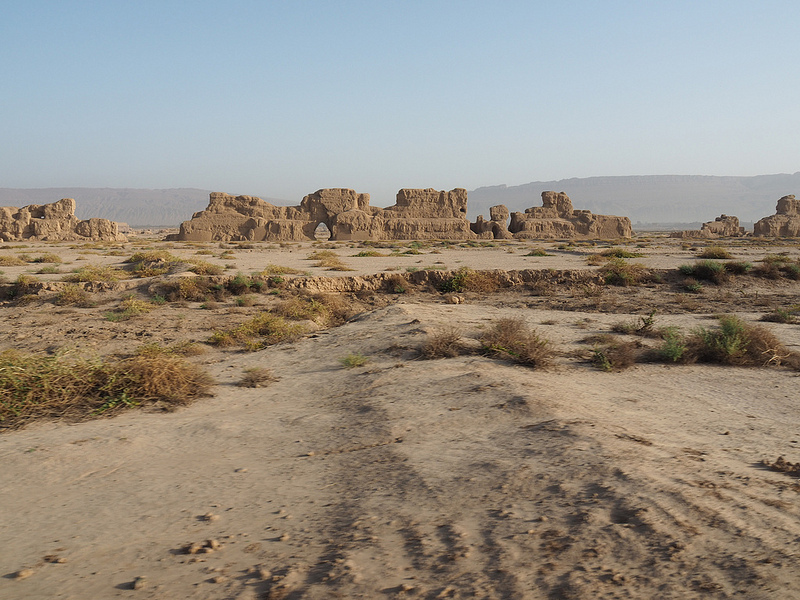 Finally, we will visit Subah, an ancient city that remains in ruins but was once the capital of the Kingdom of Guici and dates back around 4,000 years. In the evening we will board our sleeper train and begin our 10-hour overnight journey to Ürümqi. Overnight on the train. Upon arrival we will transfer to the hotel for a short rest and shower before joining for breakfast and heading out to explore the city of Ürümqi. 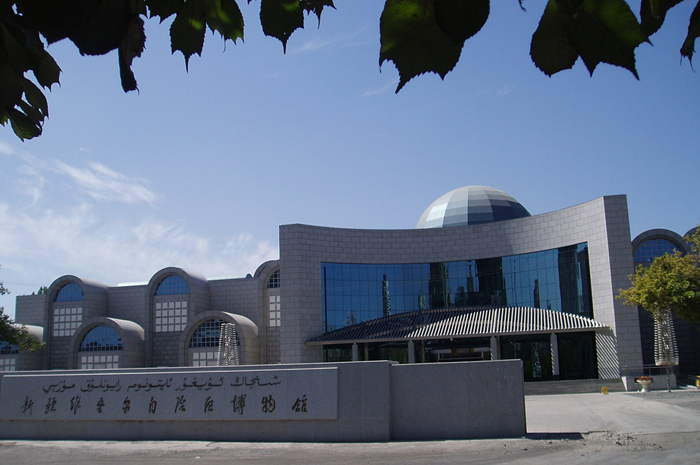 Among other places, we will pay a visit to the Xinjiang Regional Museum. The museum is a virtual treasure trove of Western China discoveries and houses over 50,000 items, ranging from recently discovered Ancient Caucasian mummies and their artifacts; silks and writing in various languages from various eras; and dried food that dates from the Tang Dynasty era around 1,200 years ago. Overnight at the Yilite Hotel in Ürümqi. After breakfast we will drive 110km miles outside of Ürümqi to the Heavenly Lake. 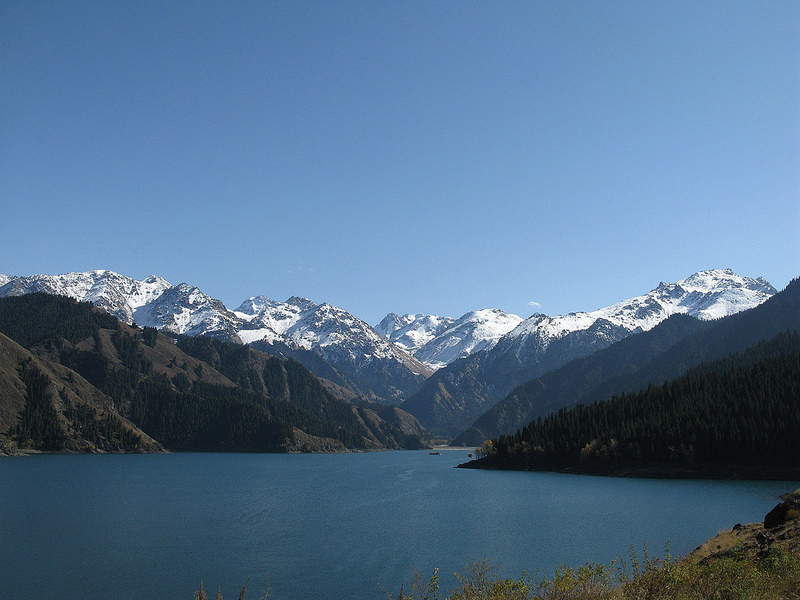 Surrounded by beautiful, snowcapped Tian Shan Mountain peaks and located in the middle of Bodga Peak, the crescent-shaped area of Heavenly Lake deserves its name, “Pearl of Heavenly Mountain”. We will explore the surroundings and have an opportunity to climb the steps to a temple on the hilltop with sweeping views and enjoy a boat cruise on the lake. 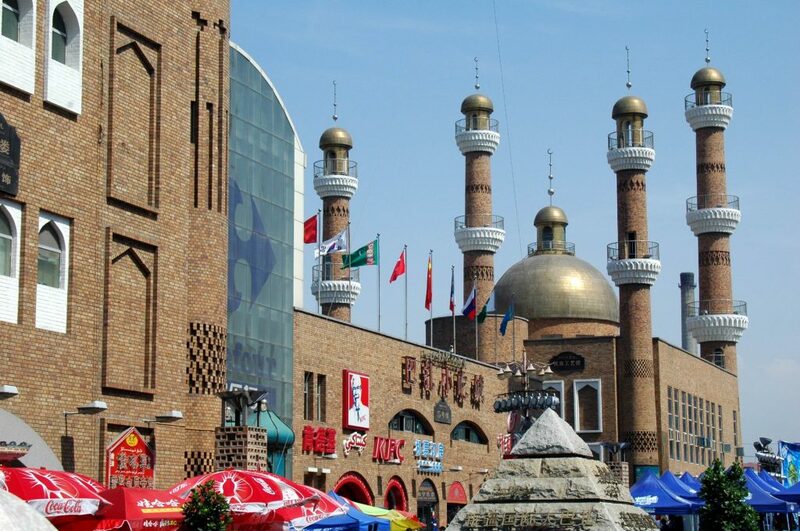 Returning to Ürümqi, we will visit the Erdaoqiao Market, which is the largest in the city. Later we will enjoy dinner in the old town and have the evening at leisure. Overnight at the Yilite Hotel in Ürümqi. 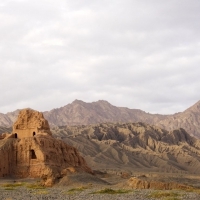 Today on our China tour, we will drive roughly 3-hours on the Silk Road to the city of Turpan, which is also known as Turfan or Tulufan. 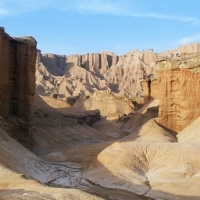 The area around the city, the Turpan Depression, is the lowest point in China and second lowest on Earth (after the Dead Sea) at 154 meters below sea level. 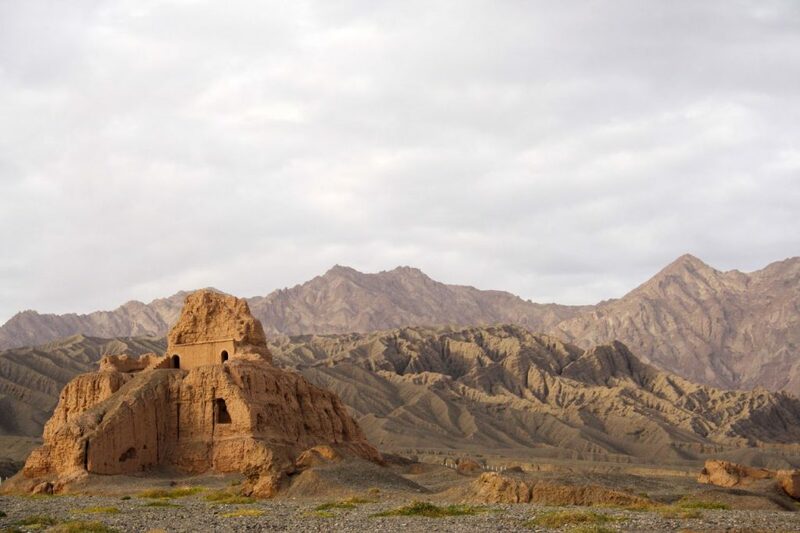 We will venture out to the desolate Gobi Desert and visit first the sprawling Gaochang Ruins, located at the foot of the Flaming Mountain (the hottest area in China), about 46 kilometers southeast of Turpan. 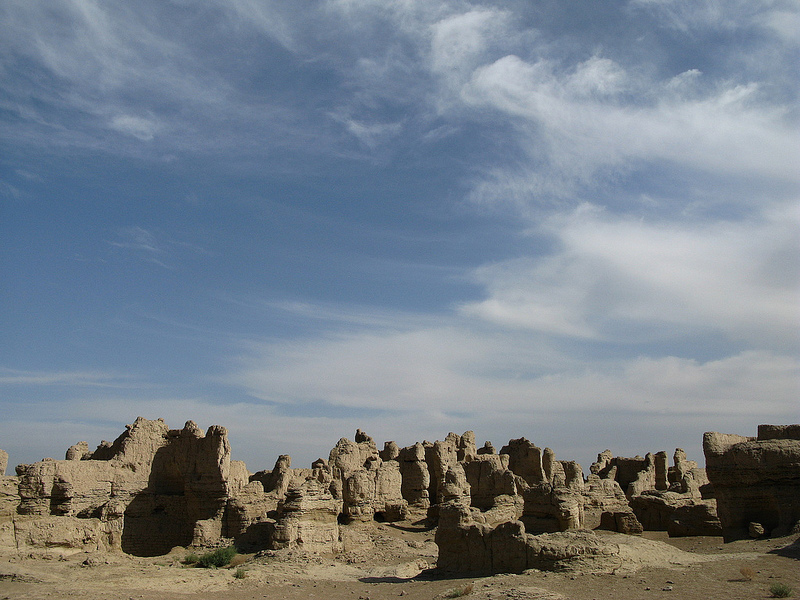 The ancient city of Gaochang was at one time a fortress city for the Han Dynasty and the Tang Dynasty army garrisons, and it was a fortress city and a capital city for the Turpan region for more than a thousand years. It was a stopping place and market town for caravan traders. Now it is lays across a long stretch of sandy piles of mud and bricks with the remains of walls and buildings scattered around. Nearby we will also visit the Astana Graves, which holds mainly Chinese tombs and Chinese shrines that date from about the middle of the 200s to the late 700s. Over the years thousands of historical relics had been unearthed in this area, including writings, paintings, stone and pottery wares, and ancient coins. 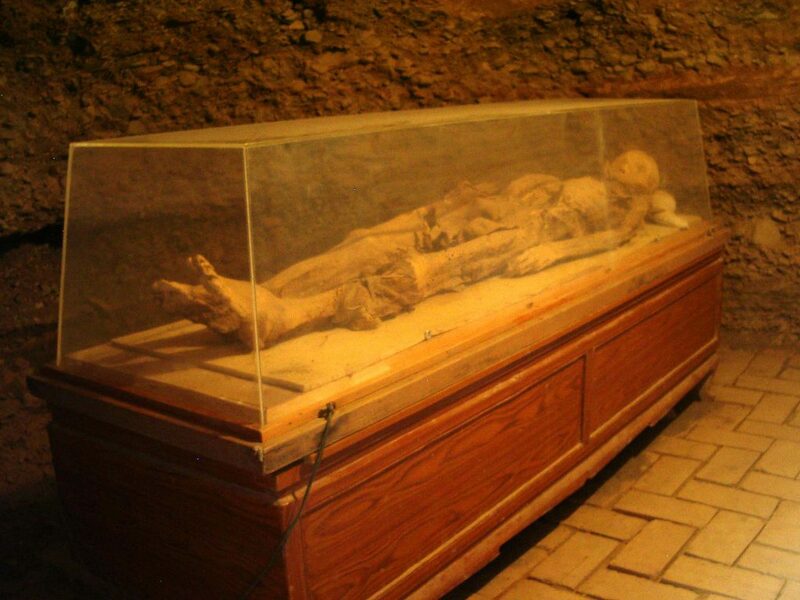 Although there are almost 500 tombs in this area, only three tombs are open to the public, including one which houses two mummies and the other two have murals. 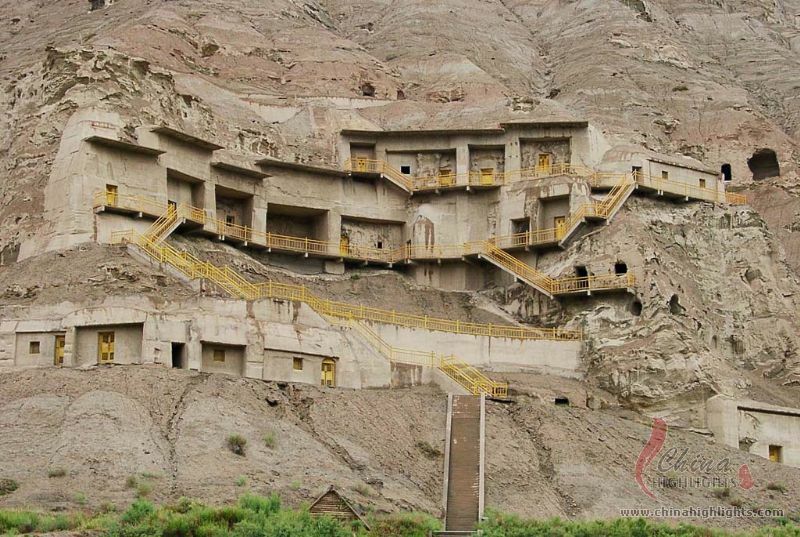 Lastly we will pay a visit to the spectacular Bezeklik Thousand Buddha Caves. 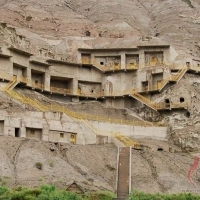 This imposing complex of Buddhist cave grottos were carved over a 900 year-long period of time between about 400 and 1,300 AD. In these grottoes, people created artwork depicting daily life and their religion. Nearby to the caves are some stunning sand dunes which can be climbed and admired for excellent photos of the complex. 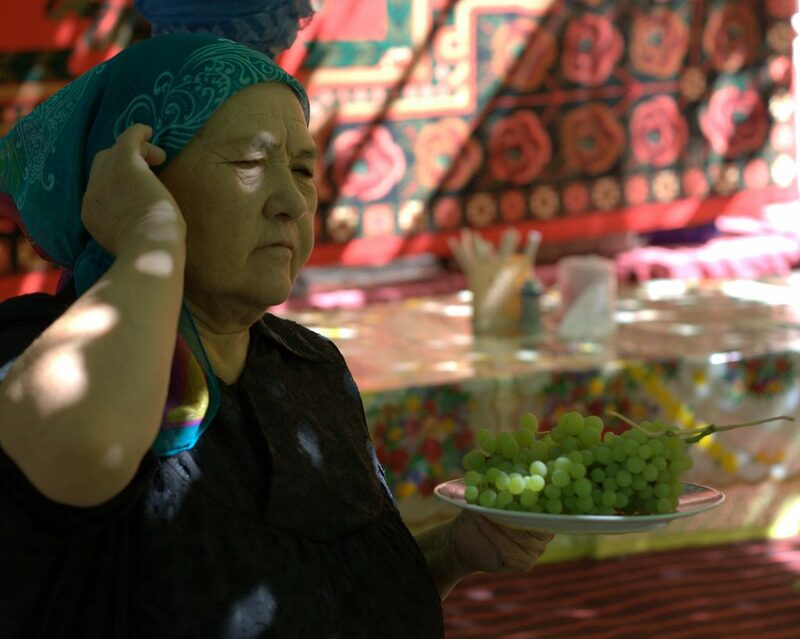 Turpan is famous for their grapes, which are grown primarily for raisins but also used for wine, and you will have the opportunity to taste this at dinner tonight (optional). Overnight at Huozhou Hotel in Turpan. 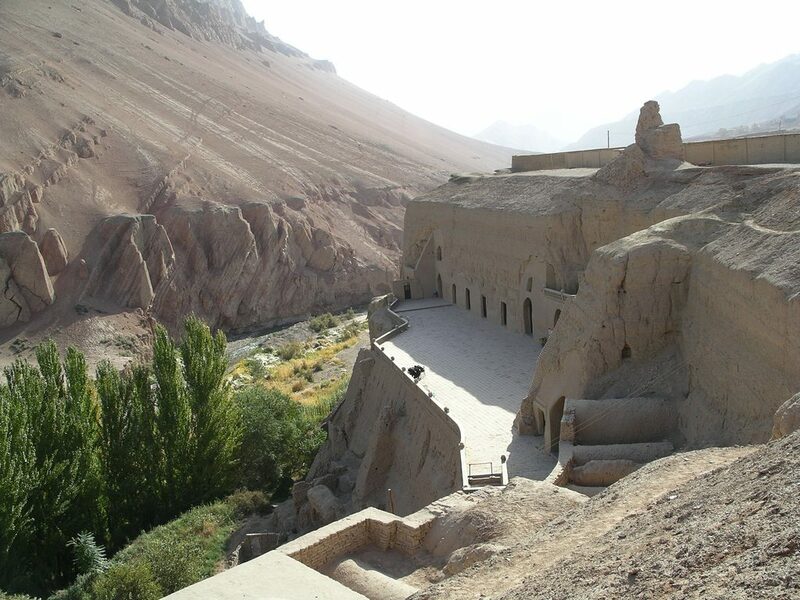 Today on our China tour, we will do some more exploring of the Turpan area with visits to the Karez Well System, where we will learn about the agricultural practices of the local people and explore the tunnels. 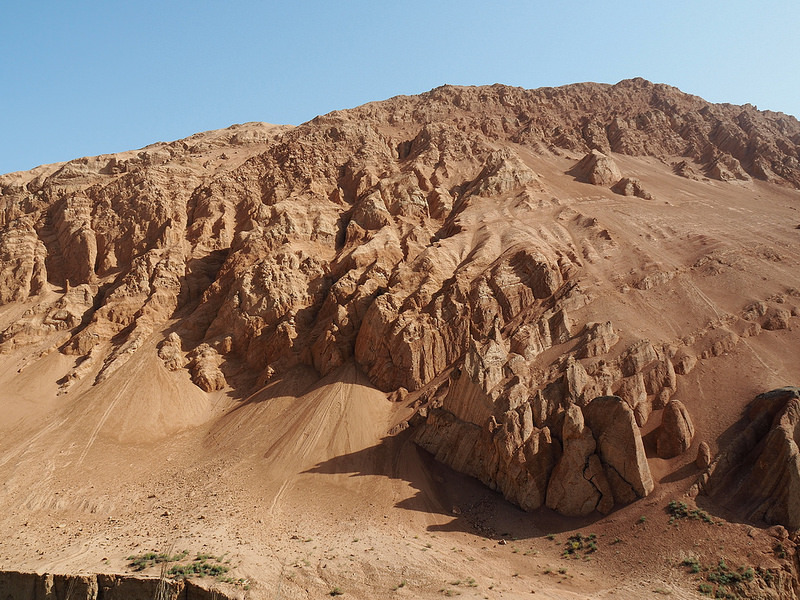 Next we will head to the Flaming Mountains, also called “Red Mountain”. Their striking gullies and trenches caused by erosion of the red sandstone bedrock give the mountains a flaming appearance at certain times of the day. 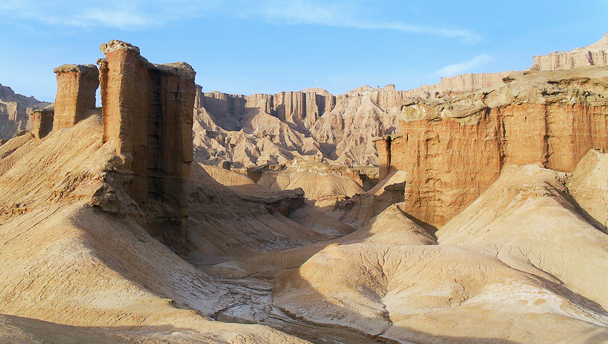 We will enjoy a walk around this stark area admiring the backdrop to the oases and scenery of the Turpan. Later we will drive to the historic Jiaohe Ruins, which is the largest, oldest and best-preserved earthen city in the world, with a history dating back 2300 years. Walking along this majestic place among the town structure — administration building, residential area, guard tower, temple — will give you a feeling of traveling back in time. 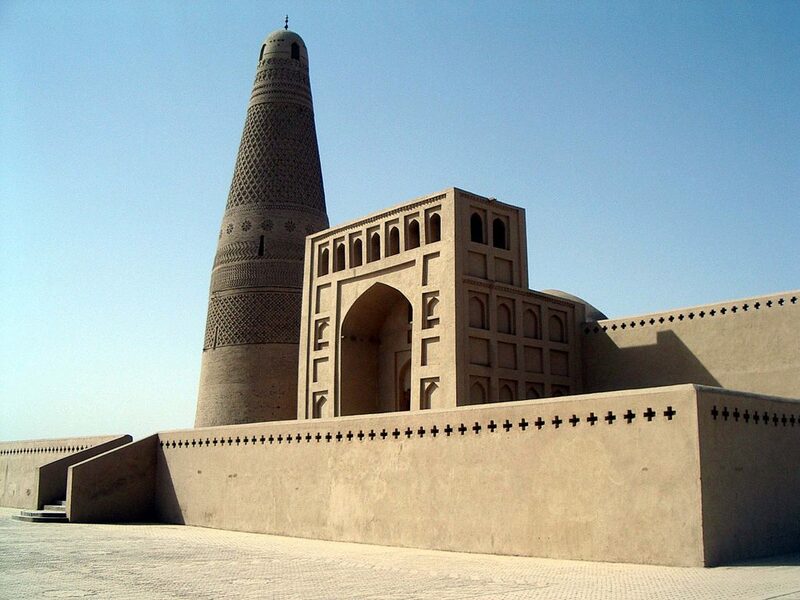 Finally we will visit the Islamic, Emin Minaret (Sugong Tower), the largest minaret in China. In the evening we will board our 9-hour overnight train to Liuyuan. Overnight on train. 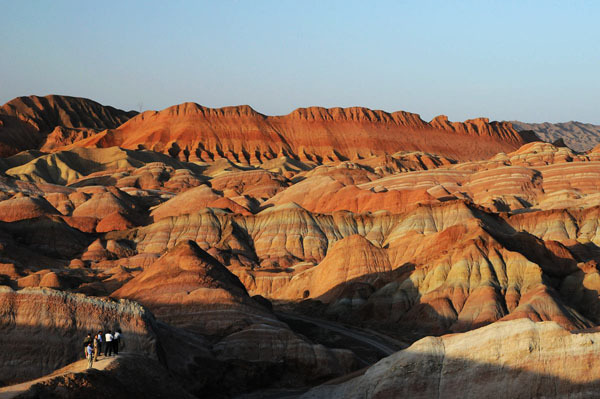 In the morning, we will arrive at the railway Liuyuan Station and drive to Dunhuang, where we will visit the Mogao Caves, a UNESCO World Heritage Site. 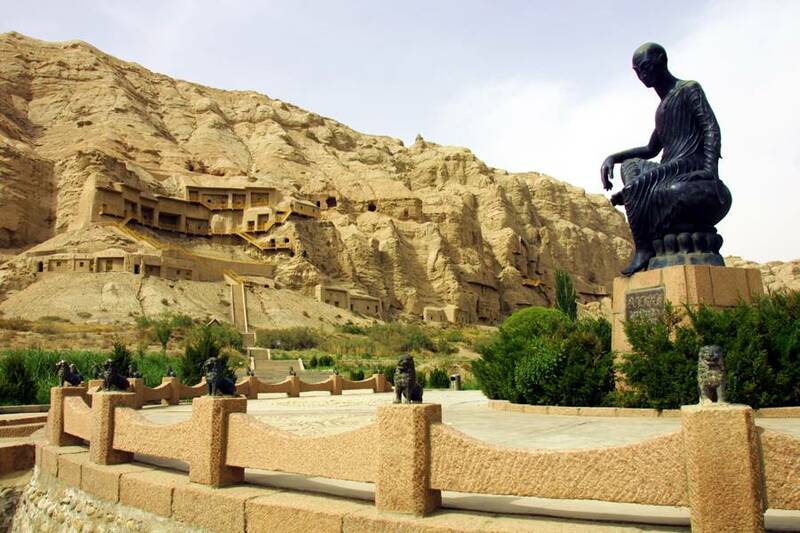 Situated on a strategic point along the Silk Road, the 492 cells and cave sanctuaries in Mogao are well-known for their statues and wall paintings, comprising the largest and longest used treasure house of Buddhist art in the world. There are about 30 caves open to the public, and we will have a comprehensive and informative visit of about 10 of them. 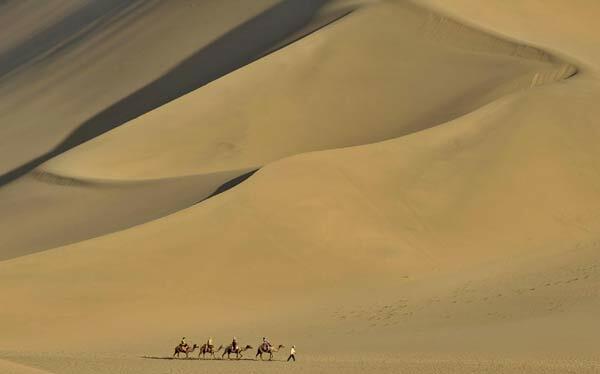 Later we will head to the beautiful Crescent Moon Lake, where we will take an enjoyable camel ride among the smooth yellow Mingsha Sand Dunes. Overnight at the Jiayuguan Hotel in Dunhuang. 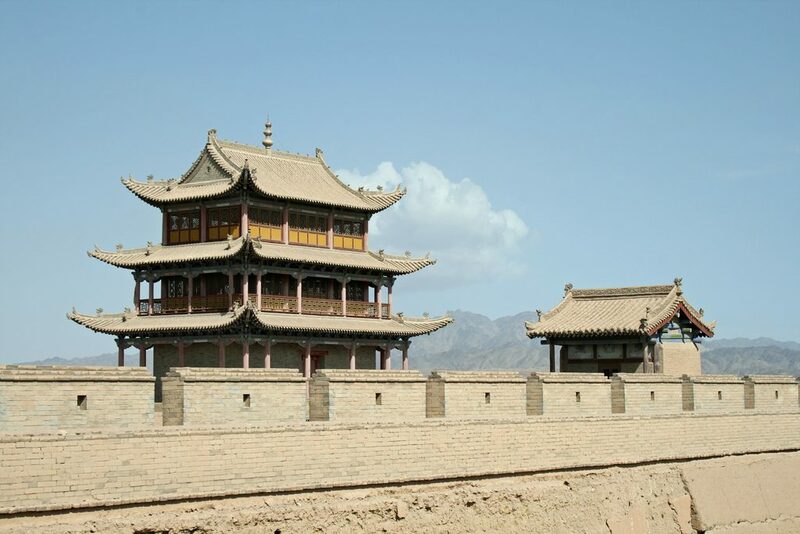 After breakfast, we will drive to the Jiayuguan Pass, which is the western starting point of the Great Wall of China. We will visit the impressive fortress where there is a two-storied watchtower on each corner. Next, we will walk along the Great Wall on the Cliff. 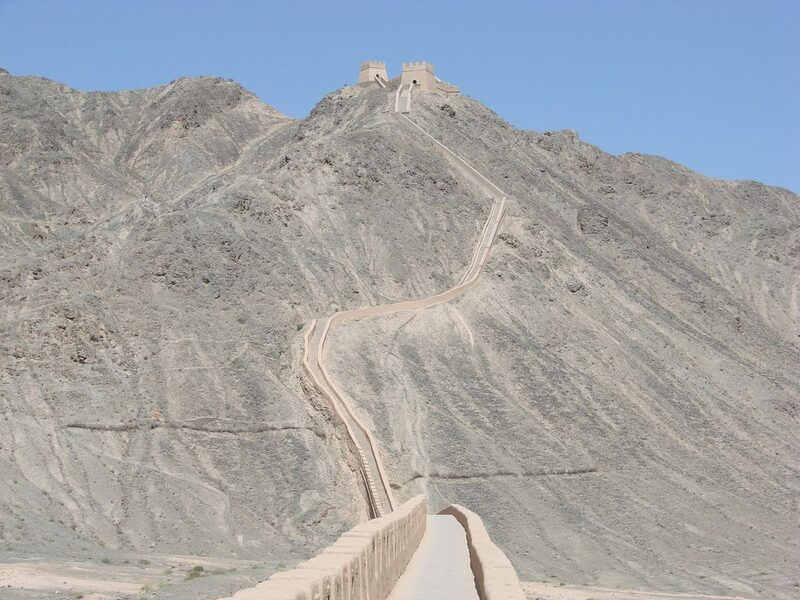 This section of the Great Wall was built on a steeply sloping valley mouth among strikingly arid scenery. We will enjoy some time in this remote area of the Great Wall before heading to the train station for our overnight trip to Lanzhou. Overnight on the train. 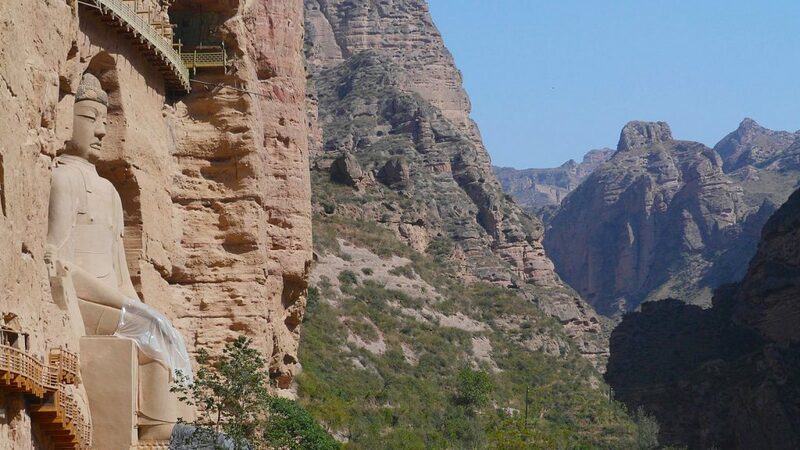 Upon arrival in Lanzhou, we will head to our hotel for breakfast and then drive out to Liujiaxia to visit the Bingling Temple by yacht, which has one of the biggest surviving carved statues of Buddha from the Tang Dynasty era (618-907) in China. Next, we will continue our cruise and visit the Zhognshan Iron Bridge bridge, built during the Qing Dynasty and renowned as the “first bridge on the Yellow River under the heaven”; the ancient Waterwheel Garden, which was once used to lift water from the Yellow River to supply the needs of this dry region, and where we may also have a chance to ride on a raft of inflated sheep skins (optional); and the Yellow River Mother Sculpture, which is the most beautiful of its kind in China. Overnight at JJ Sun Hotel in Lanzhou. After breakfast this morning on our China tour, we will set off on an 8-9 hour drive across Ningxia province to Xi’an. Arriving in the mid-afternoon, we will stretch our legs and explore the old city areas on foot and enjoy a traditional dinner. Overnight at the Skytel Hotel in Xi’an. 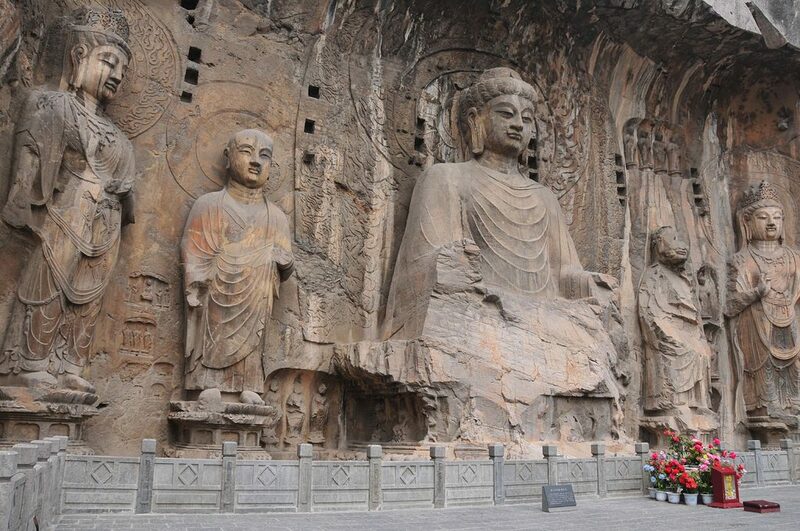 This morning on our China tour, we will take a short 2-hour train to Luoyang, where we will visit the nearby Longmen Grottoes, a UNESCO World Heritage Site and a spectacular example of Chinese Buddhist art, housing tens of thousands of statues of Buddha and his disciples. 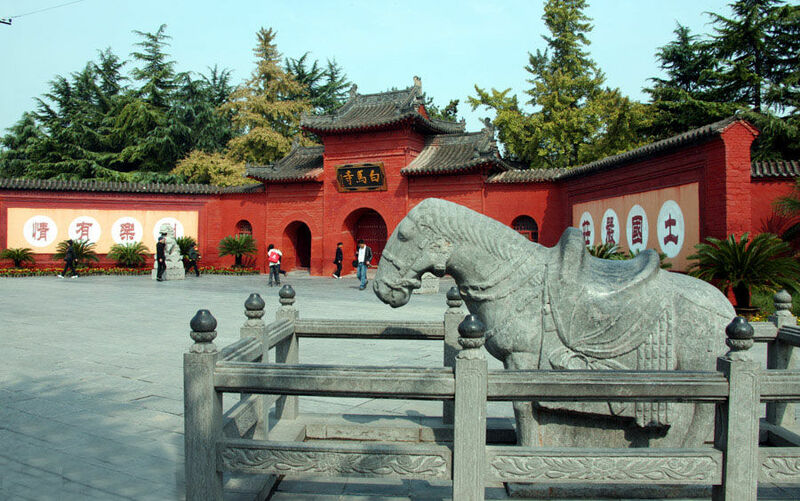 Later, we will visit the White Horse Temple, which boasts architecture which has remained intact for over 1,900 years. After a traditional lunch, we will make our return by train to Xi’an. We will have the evening at leisure and dinner in the old town (optional). Overnight at the Skytel Hotel in Xi’an. 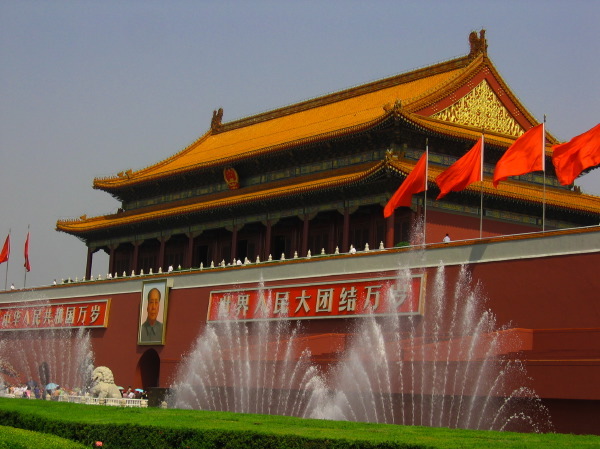 Today on our China tour, we will visit the UNESCO-listed and mindblowing, Terracotta Army, which is a vast collection of terracotta sculptures depicting the armies of Qin Shi Huang, the first Emperor of China, which was buried with the emperor in 210–209 BCE and whose purpose was to protect the emperor in his afterlife, and is considered the most significant archaeological excavations of the 20th century. Remaining hidden for 2,200 years, and only discovered in March 1974, over 6,000 pottery soldiers (each soldier has distinct facial features), horses, chariots, and even weapons have been unearthed from these pits. 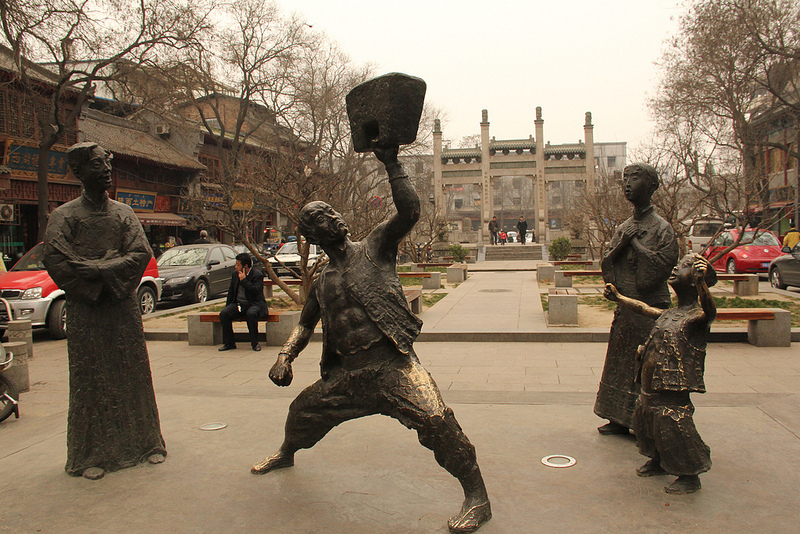 Later we will explore the old city walls area of Xi’an with its ramparts, gates and watchtowers that form one of the oldest and most complete city defenses in the world. Overnight at the Skytel Hotel in Xi’an. 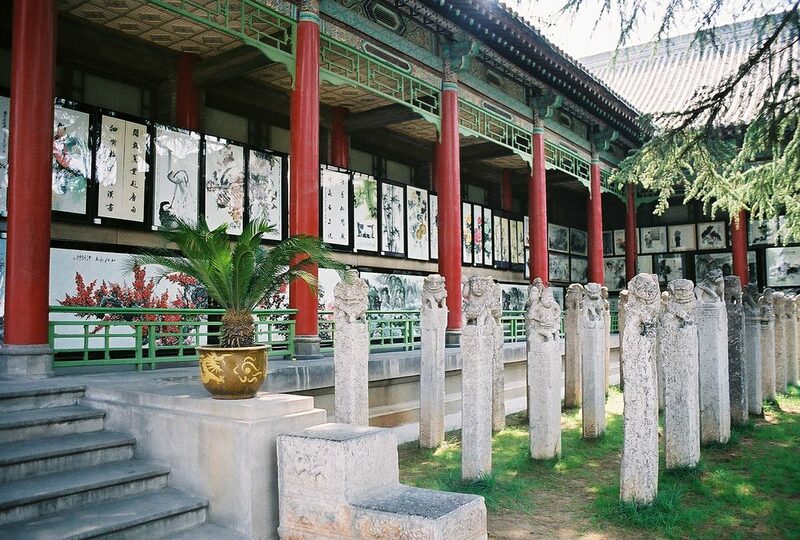 This morning we will visit the 900-year old Forest of Stone Steles Museum, which focuses on displays of stone steles, epigraphs and stone sculptures from past dynasties and houses over 11,000 relics. We will then head to the airport for our short flight to Zhangjiajie. 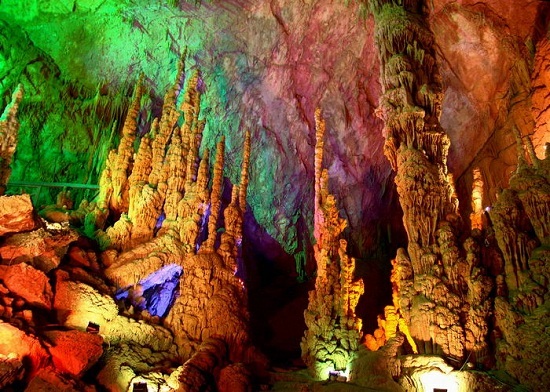 Upon arrival, we will visit the Yellow Dragon Cave, home to an impressive collections of stalactites and stalagmites and illuminated in a variety of colored lights. Later we will visit Baofeng Lake and take a wooden boat for a short boat ride along the clear waters and unique scenery. 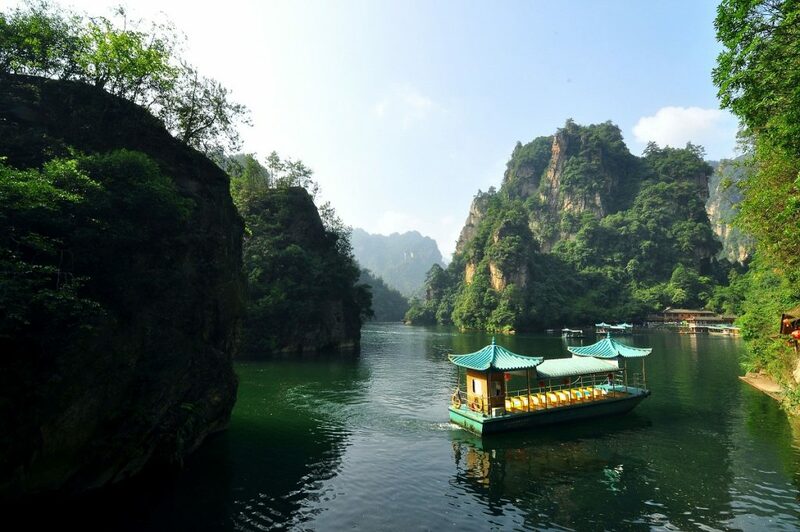 Next we will explore the Golden Whip Stream, which is located inside the UNESCO-listed Zhangjiajie National Park and stretches of 7.5 km from north to south, winding along mountains and a shaded paths. 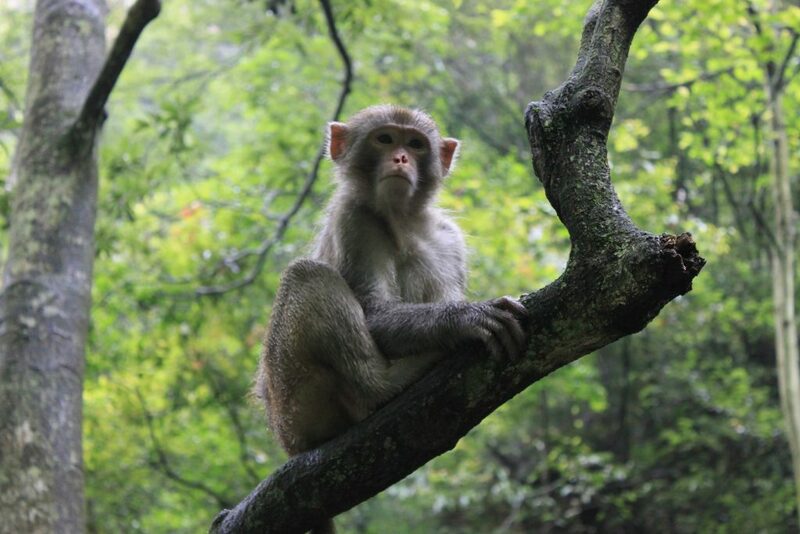 Over our 2-hour walk we will be able to admire the many groups of friendly monkeys that inhabit areas along the forest and stream. Finally, we will take a scenic cable car up to Huangshi Village, a visual treat and considered one of the top 5 highlights of a visit to China. We will take a pleasant walk around the greenery and enjoy the epic views and fresh air. Overnight at the Wulingyuan Hotel in Zhangjiajie. This morning we will visit the Zhangjiajie Gorge (also known as the Zhangjiajie Grand Canyon) — one of the highlights of our China tour. 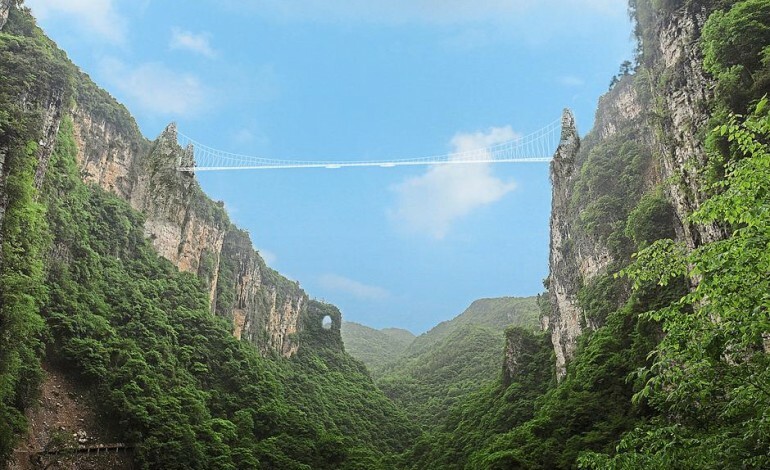 At the gorge is both the tallest and longest glass bridge in the world, 380 meters long and 300 meters from the bottom of the gorge. There is also a bungee jump atop the gorge, which is the highest in the world. Later, we will drive to Fenghuang, on the border with Henan province and renowned to be one of the most beautiful cities in China. We will explore this fantastic town with its unique homes built on stilts clinging to the side of the mountain surrounding the Tuojiang River. Quiet and secluded during the day, at night the town becomes a world of glittering lanterns and liveliness. We will enjoy dinner at a traditional restaurant decorated in Miáo minority style. Overnight at the Phoenix Grand Hotel in Fenghuang. We may wake early to catch the sunrise over the mysterious and beautifully scenic city of Fenghuang before beginning our long 6-7 hour drive to Zhaoxing. Overnight at the Zhaoxing Hotel in Zhaoxing. After breakfast, we will enjoy an easy couple hour light hike to the Zhaoxing Dong village, one of the largest Dong villages in Guizhou Province with over 1000 households. Their drum tower complex is considered the largest one in China. 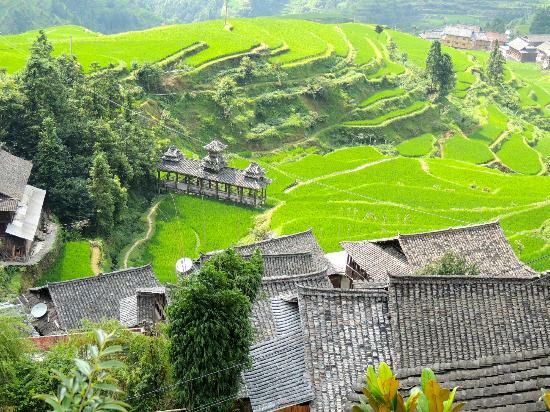 Later we will continue to Tang’an Village, which is built on a steep mountain slope overlooking terraced paddy fields. 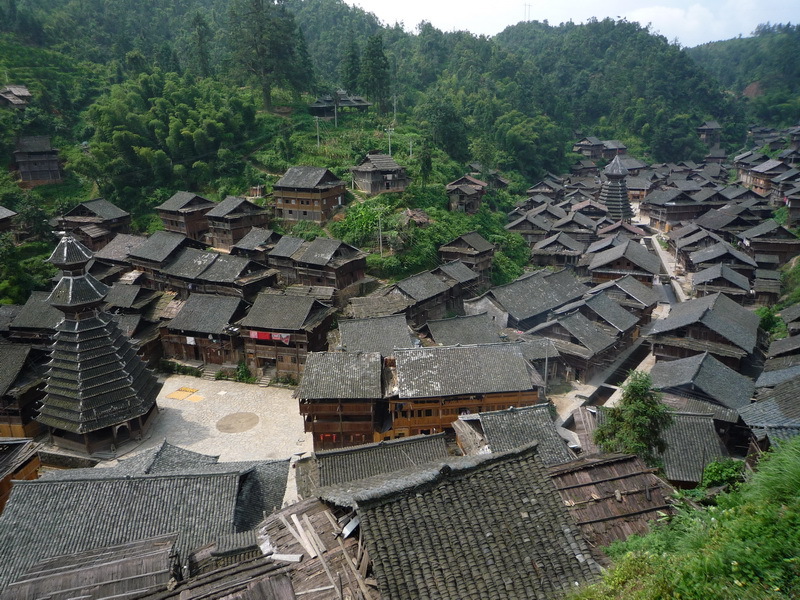 The village contains ancient wooden buildings, and a traditional drum tower. Overnight at the Zhaoxing Hotel in Zhaoxing. 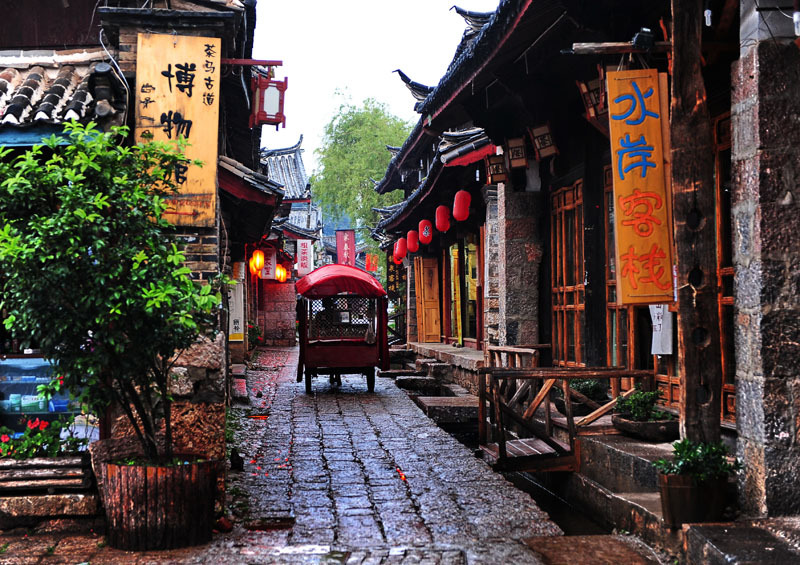 Today on our China tour, we will drive to Rongjiang, first stopping in the rural and charming village of Congjiang filled with traditional wooden Dong houses. Next we will pay a visit to Basha Miao Village, an old Miao Ethnic village where locals still practice their unique traditions dating to Qing Dynasty of 2200 years ago. 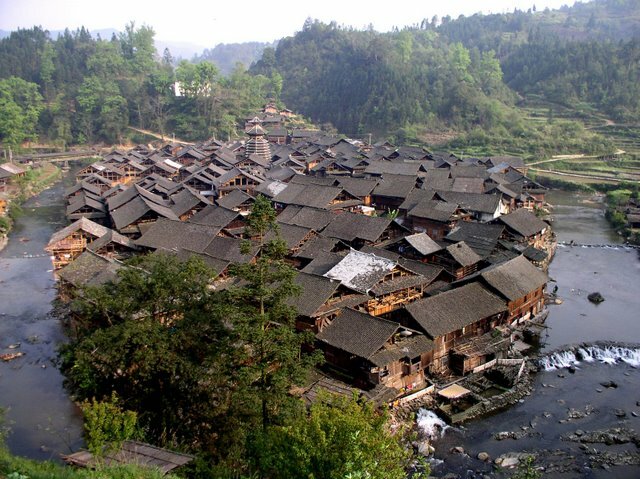 Residents of this village have largely been untouched by the modern society and still live in their wooden houses, practicing centuries-long custom and have their own unique beliefs. Later we will stop at Yintan Dong village, located on the top of the mountain and surrounded yellow trees surround the village. The village is known for their architecture, particularly their drum towers, and wind and rain bridges. Overnight at the Dongxiangmi Hotel in Rongjiang. After a short visit to the morning market in Rongjiang, we drive over the Leigongshan Mountain to Kaili. 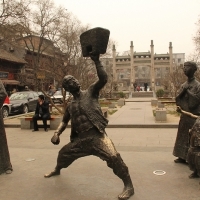 Throughout the day we will explore the beautiful surrounding areas, starting with Rongjiang County and its is old town with the history of over 2000 years and where the Dong and Miao ethnic nationalities originated. Next we will head to Mt. 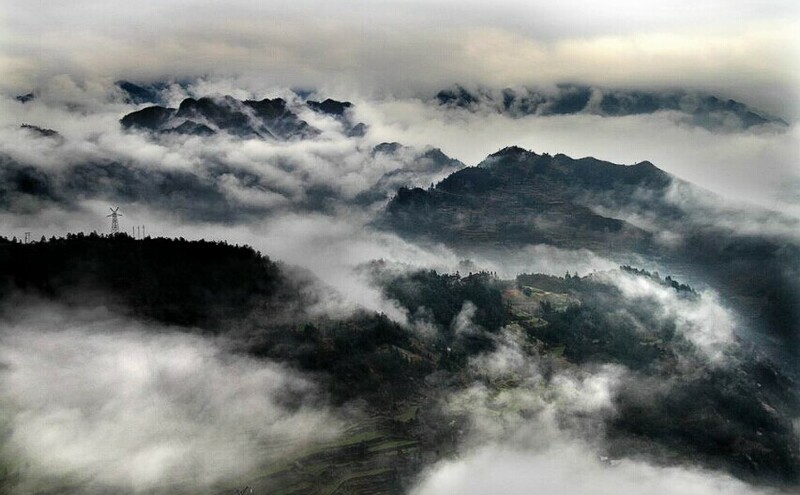 Leigong located 15 kilometers east of Kaili, Guizhou Province, Leigongshan is the most fascinating scenic area of the Miaoling Mountains. It gained its reputation for its abundance of overlapping mountain ridges, flourishing verdant plants, valuable and rare animals, and historical war remains. 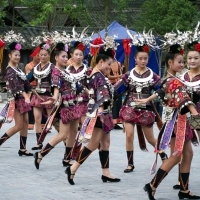 Further on we will stop off at the Kaili Datang Short Skirt Miao Village, which stands out from the other Miao villages in the region because of the distinctive style of dress worn by Miao females. 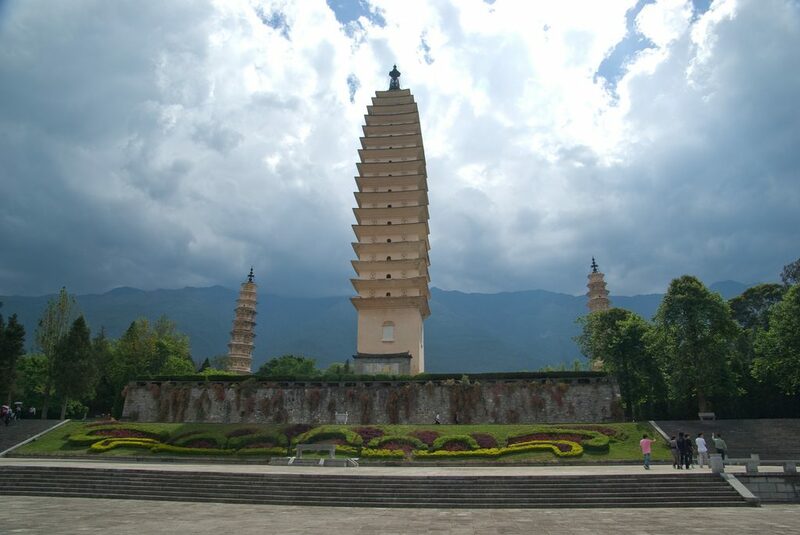 Lastly, we will visit the Matang Ge Stronghold, located in Longchang Town. Overnight at the Heaven Sent Dragon Hotel in Kaili. This morning on our China tour, we will drive from Kaili to Anshun via Guiyang. 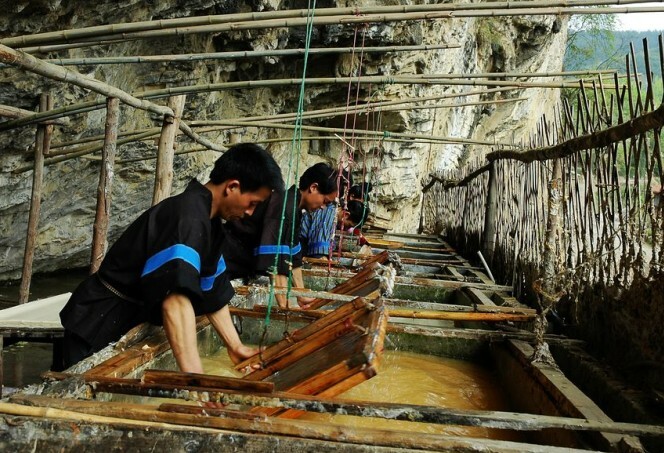 We will the Shiqiao Miao village to see its traditional way of making paper from the bark of mulberry tree. This method of making paper has a history of more than one thousand years, local people still keep it and extend to make color paper using different plants. Finally, we will head to a little-known or visited area outside of Anshun. 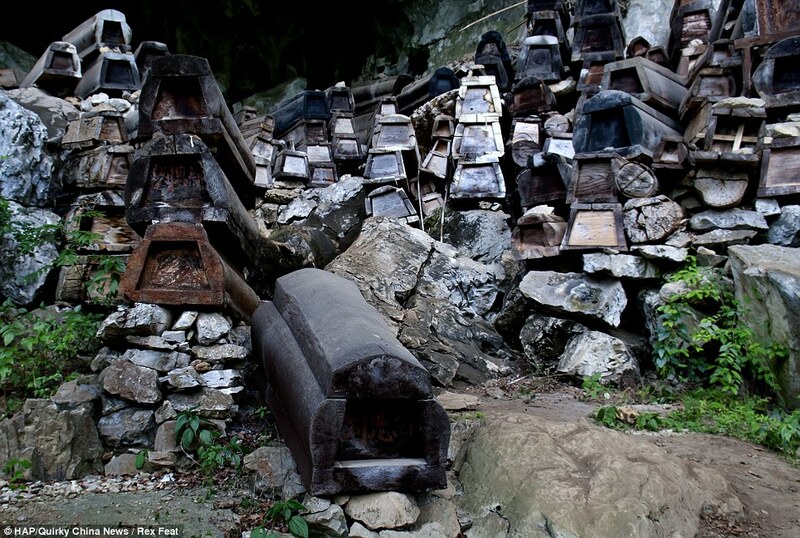 Perched on a cliffside, we will see some of the hundreds of thousands of wooden coffins stuffed and overflowing out of the darkened caves, which are left to slowly decay in the belief it will let the souls of the departed ascend into heaven. Overnight at the Grand Valley Hotel in Anshun. 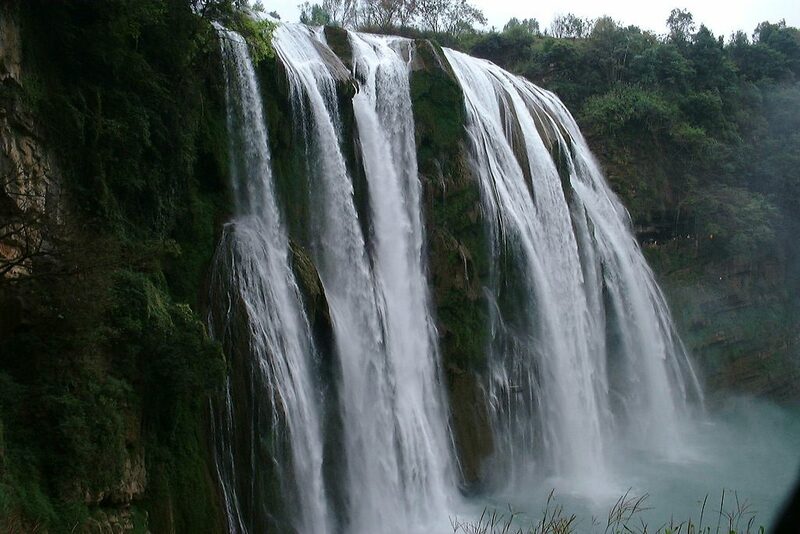 In the morning, we will visit the Huangguoshu Waterfall and Tianxing Qiao Scenic Area. Located 43 km southwest of Anshun, Huangguoshu Waterfalls are one of the largest waterfall groups in China and consist of 18 falls on the ground and 4 underground falls. The Tianxing Qiao Scenic Area features the perfect combination of stones, trees and water and is a great place for a morning stroll. Later in the afternoon we will return to Anshun and catch the express train to Kunming (7-hours). Upon arrival, we will transfer to our hotel for dinner and an evening at leisure. Overnight at the New Era Hotel in Kunming. 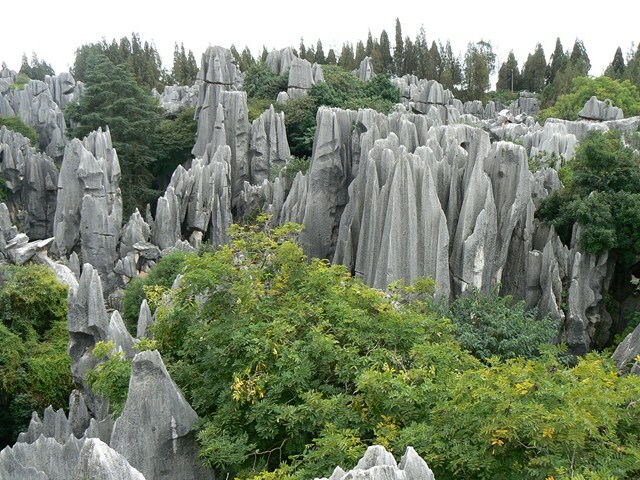 Today on our China tour, we will visit the Stone Forest, a natural phenomena located 90 km southeast of Kunming. 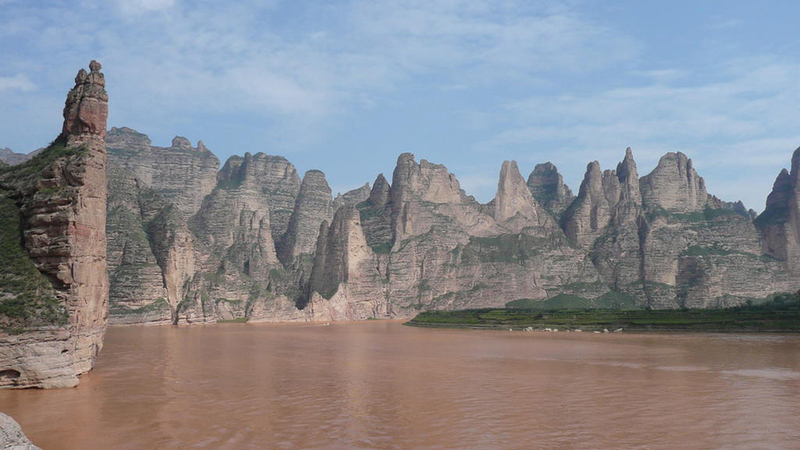 The various shapes of karst landscape was formed due to millions of years’ movement of Earth. The Stone Forest area is home of the Sani people, and their folk customs has become one spectacular scene, the colorful embroidery and minority dances combine with the natural scenery will surely leave you a deep impression. We will have lunch at the Stone Forest Ashima Hotel, which is famous for its roast duck. Return to Kunming and have the evening to explore the city. Overnight at the New Era Hotel in Kunming. After breakfast we will drive roughly 4-hours to Dali. After settling into our hotel, we will head out for a cruise on the picturesque Erhai Lake, where we will admire its islands and visit a working fishing village. 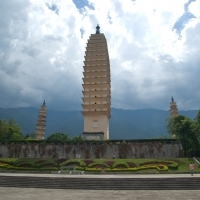 In the late afternoon, we will visit the atmospheric old town of Dali, and its ancient Three Pagodas, which were built more than 1,000 years ago and stored within the pagodas are valued Buddhist scripts and scriptures. Overnight at the Landscape Hotel in Dali. 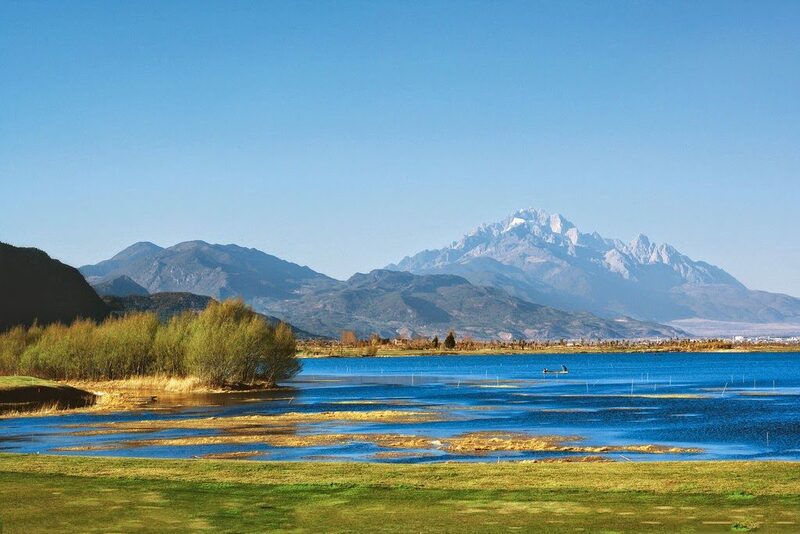 Today on our China tour, we will drive to the city of Lijiang. 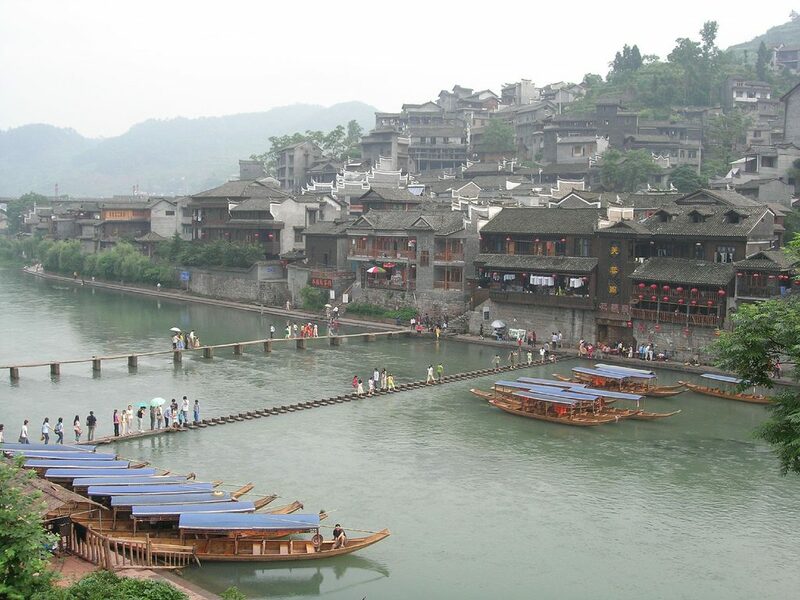 Along the way we will stop at the Houses of Bai People, located in the Xizhou. 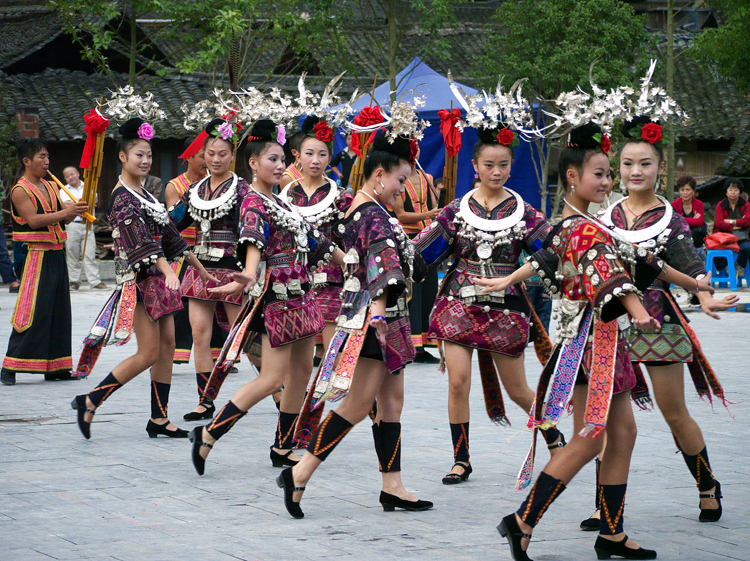 We will see typical Bai traditions and dresses here and the typical ancient architectures. On the outside walls of each house, there are numerous exquisite paintings showing the art atmosphere. After arriving in Lijiang, we will tour the old town. 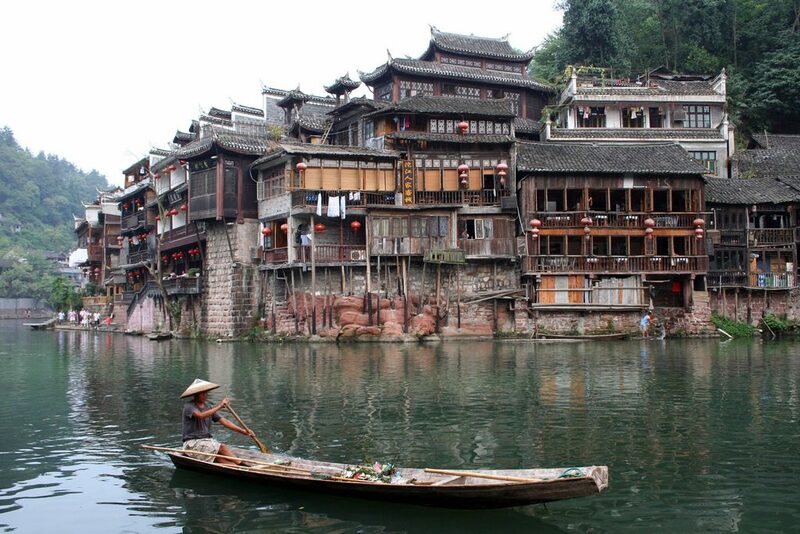 With its long history and culture, it is very rare in China that such well-preserved ancient city still exists. The old town is quite busy in the afternoon and in the evening with an active atmosphere of lights. We will also make a trip up to the Wangu Tower. 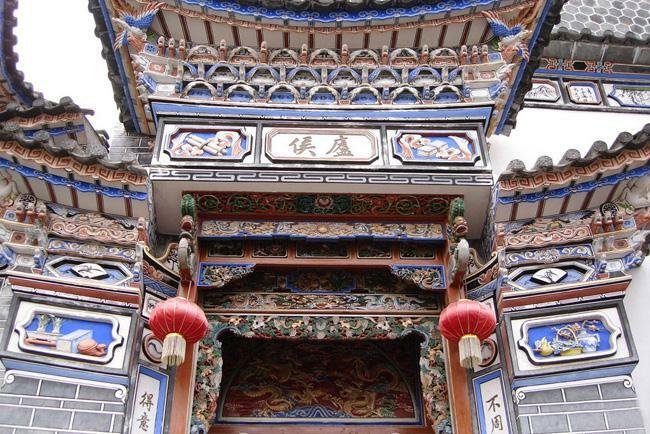 Located on the top of Lion Hill, Wangu is the landmark building of Lijiang. This pure wood building is 33 meters (108 ft) tall, overlooking the scenery of Lijiang and looking out to Jade Dragon Snow Mountain in the distance. Overnight at the Wangfu Hotel in Lijiang. Today we will visit Lashihai Lake Wetlands, which was approved as a plateau wetland nature reserve in 1998. Since then, the nature reserve has been rehabilitated, protected and improved, which has turned it into a paradise of sorts with thousands of birds spanning 57 species. 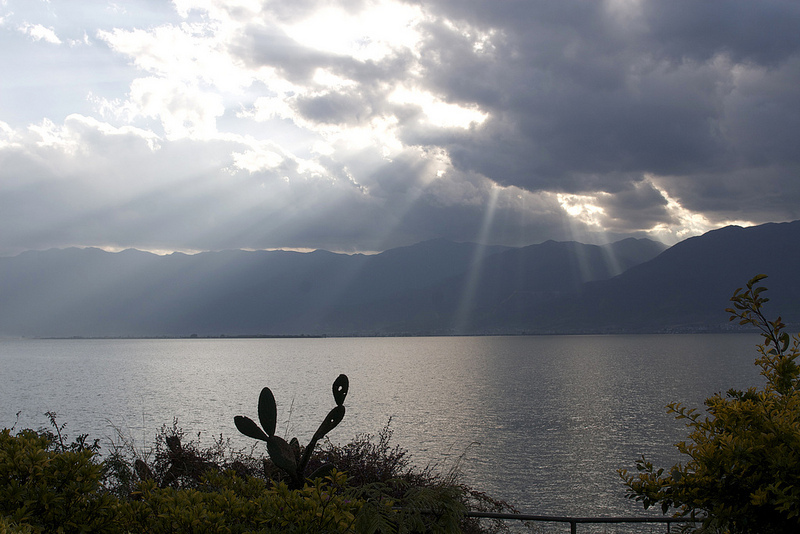 We will enjoy some time boating on the Lashi Lake and will visit Naxi and other minority nationalities inhabited around lake. 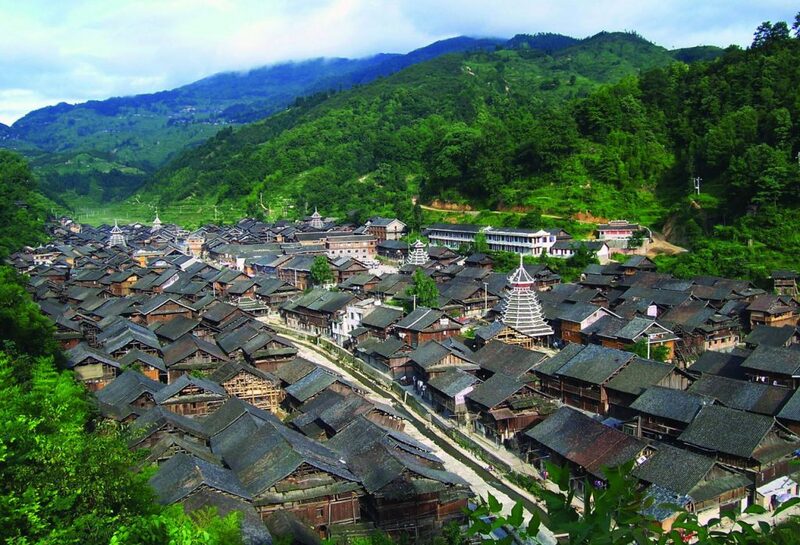 Later we will visit Shuhe, an ancient town also known as Longquan Village, it is home to one of the ethnic groups and is like a village forgotten by time and is a well preserved and important town on the ancient tea and horse route. Overnight at the Wangfu Hotel in Lijiang. After breakfast on the last day of our China tour, the morning will be at leisure and we will be transferred to the airport for our onward flight to Beijing.